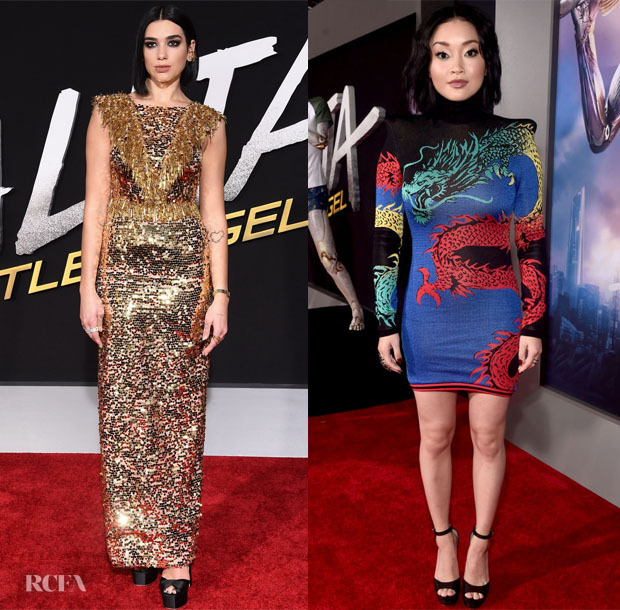 The ‘Alita: Battle Angel’ Los Angeles premiere on Tuesday (February 5) had a range of looks to discuss. Dua Lipa: She dialed up the drama in a highly embellished Prada gown. The mix of sequins and beads is sublime, but the low back might actually be my favourite detail. I foresee the chunky platforms being divisive. Lana Condor: The ‘To All the Boys I’ve Loved Before’ star showed some leg in Balmain. The knitted style with snaking dragon was a (fiery) breath of fresh air from usual red carpet outfits and a change of pace from the designer’s signature looks. Jimmy Choo shoes and Stephen Webster jewels rounded out the dynamic style. Rosa Salazar: The actress embraced every lingerie detail with lace, tulle, frills and straps in Elie Saab Pre-Fall 2018. It could have been too much, but there’s a sweetness to the style courtesy of the longer length and her styling. Jennifer Connelly: It shouldn’t surprise many to see the actress donning a custom Louis Vuitton Pre-Fall 2019 look. It juxtaposes countless elements but still presents a strong directional finish. The coordinating belt was a wiser choice than the red on the runway.